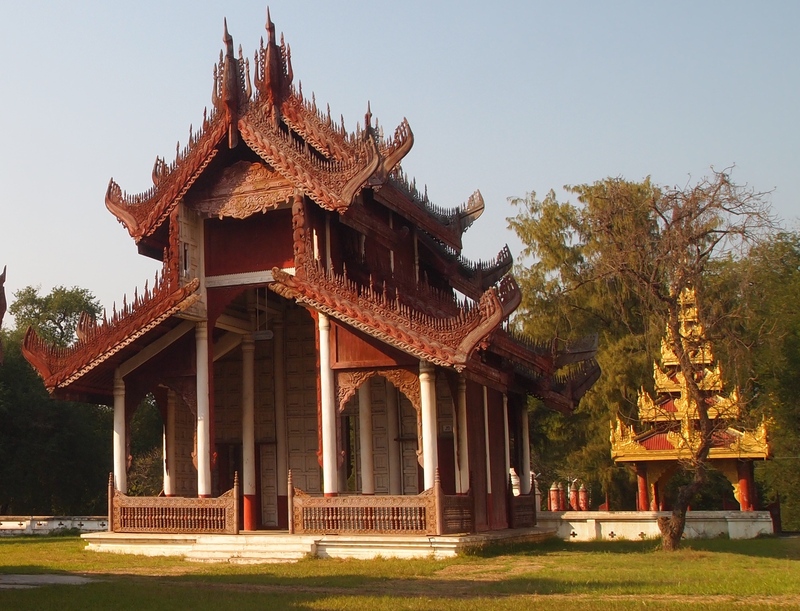 Tuesday, February 17: After my morning oxcart trip around Mingun and a relaxing riverside lunch, Mimo drives me to The Mandalay Royal Palace. 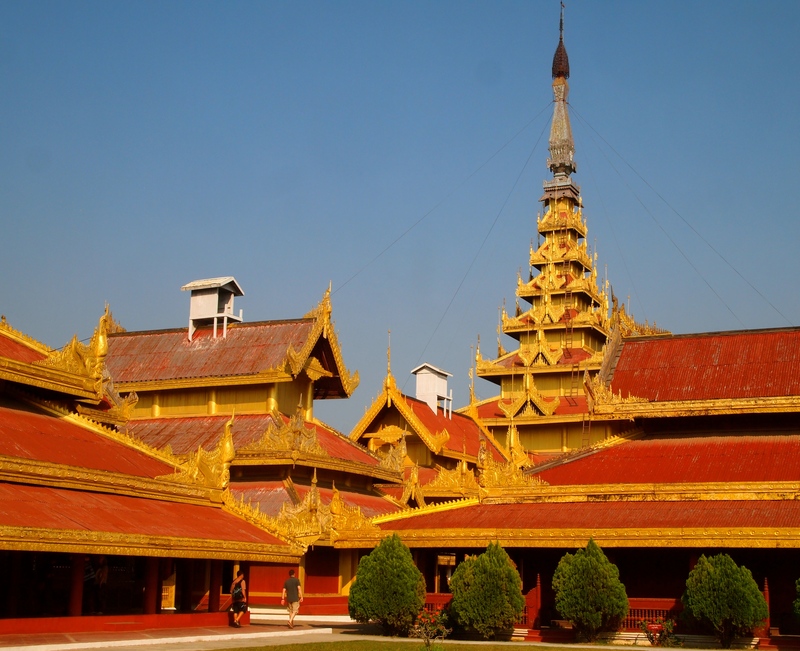 This is the last palace built by the Burmese Royals. 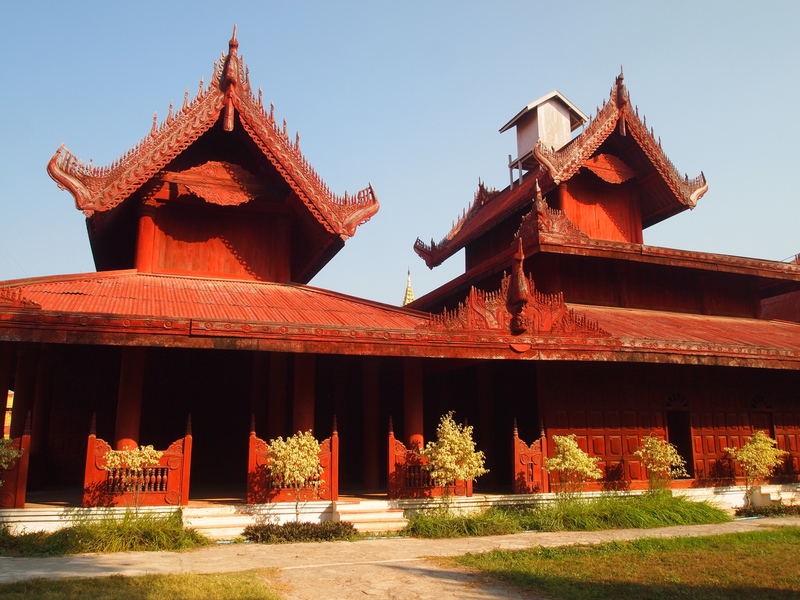 It follows the traditional Burmese palace design, inside a walled fort surrounded by a moat. 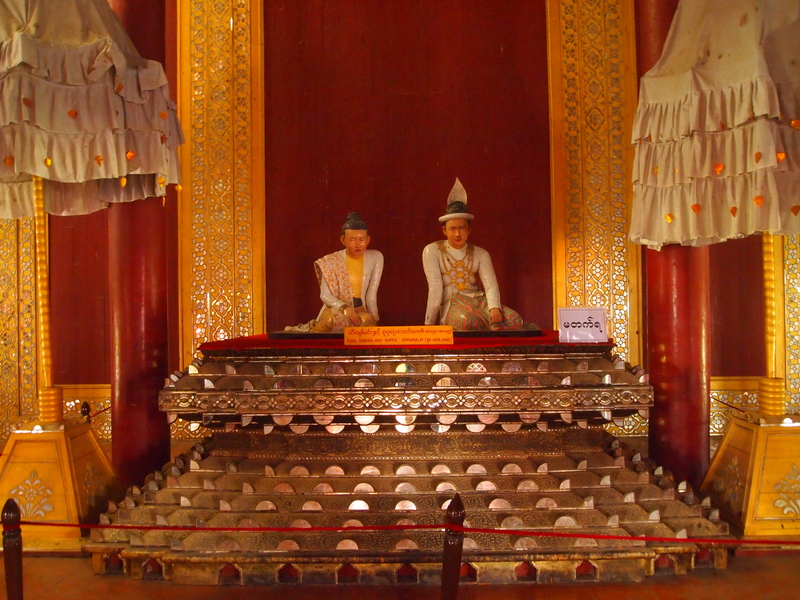 When King Mindon founded Mandalay in 1857, he ordered a Royal Palace to be built. 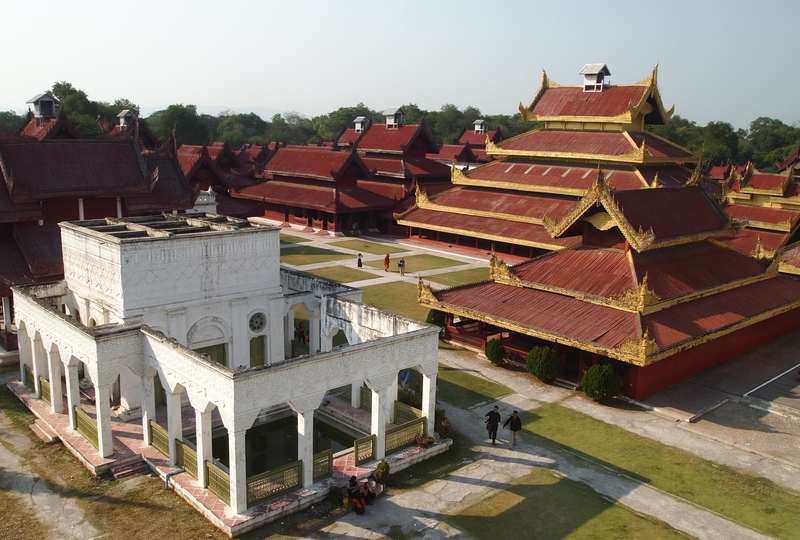 Old palace buildings from Amarapura, the old capital, and Ava were dismantled, carried and reassembled in Mandalay. 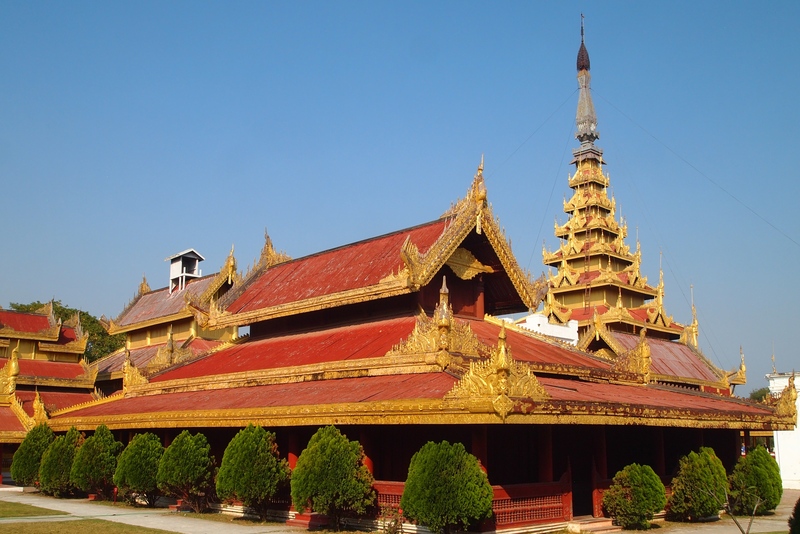 Because of the high cost of labor and materials, Burmese kings often moved old palaces to a new capital. 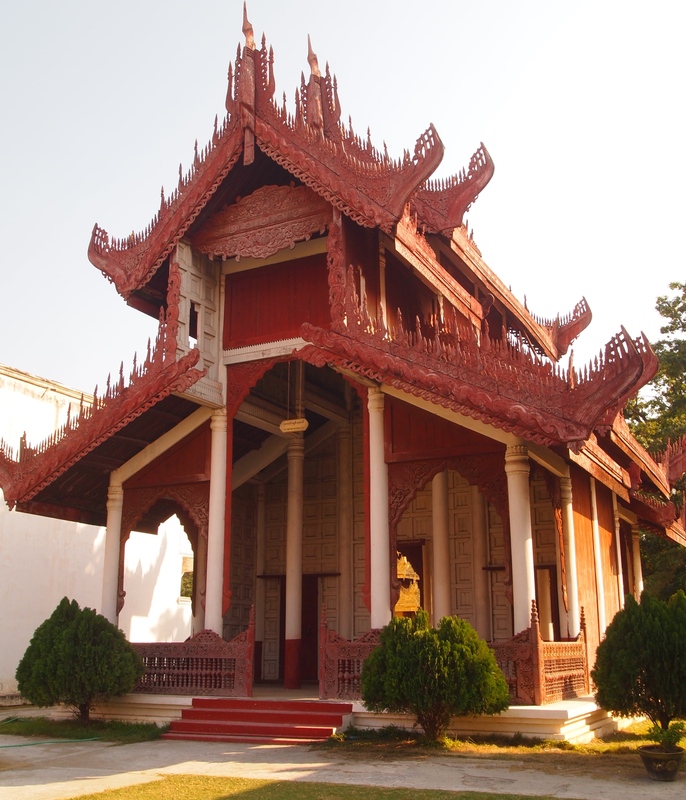 The process of dismantling and reassembling took five years to complete. 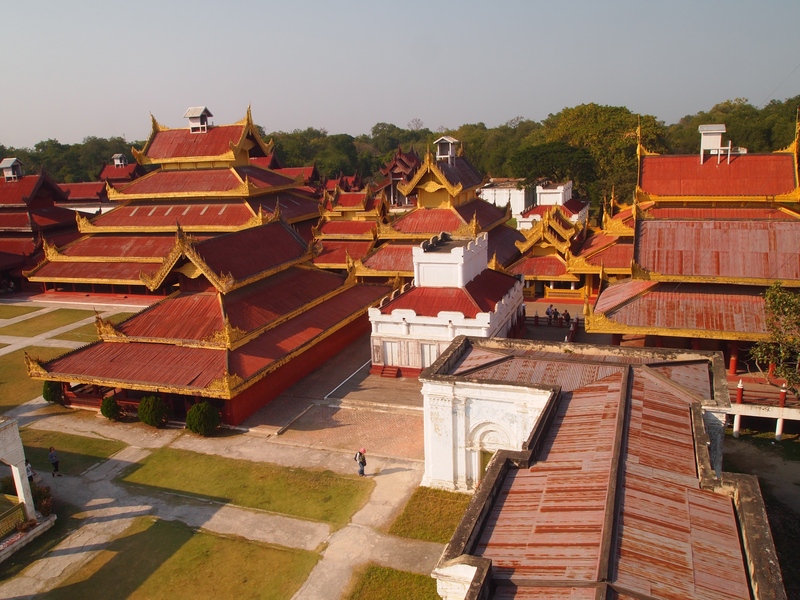 According to Today in Myanmar: Mandalay Royal Palace: The Royal Palace was modeled in line with the Brahman cosmology to represent the center of the world, the fabled Mount Meru. 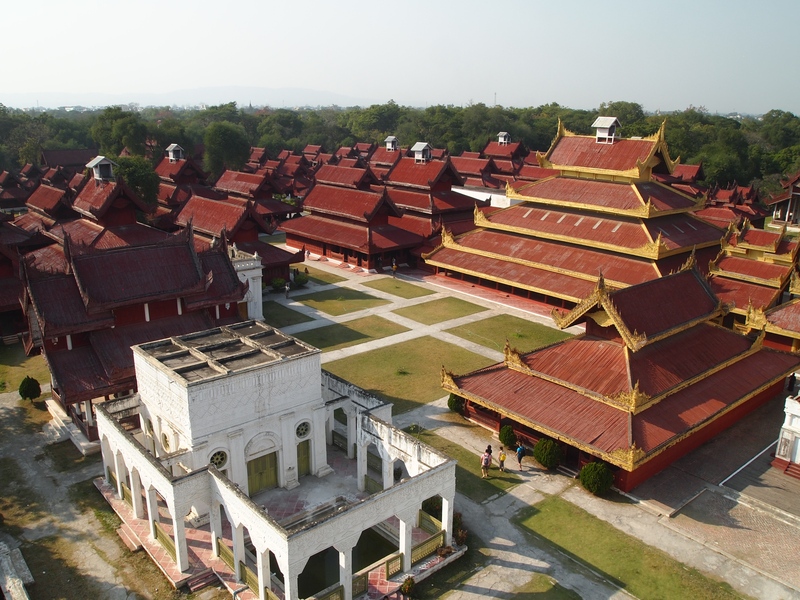 The royal palace complex was built on the square brick foundation at the center of the Royal Palace Fortress. 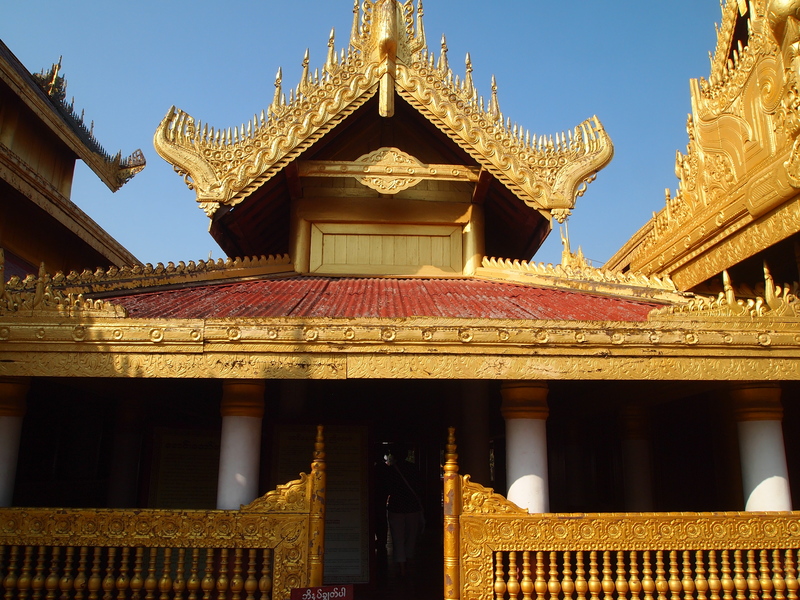 All the buildings were made of teak and gilded with gold and vermilion. 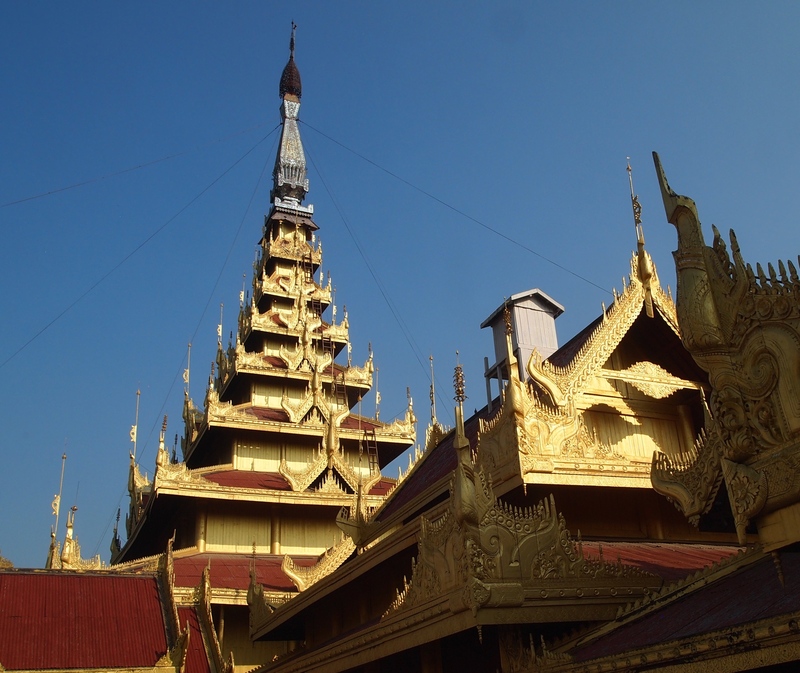 All buildings were single story buildings, but the number of spires atop a building indicated its importance. 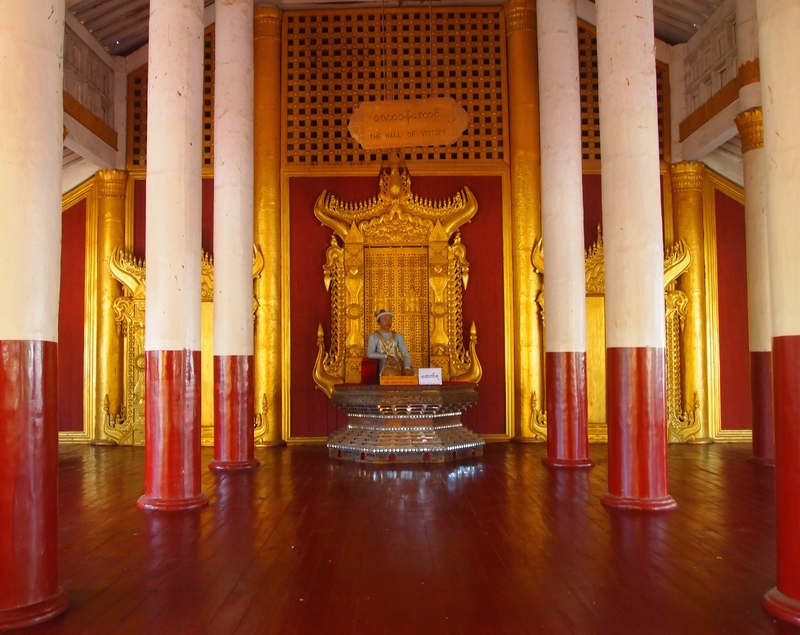 The most important structure in the Royal Palace is the Lion Throne Hall, in the exact center of the whole palace complex. 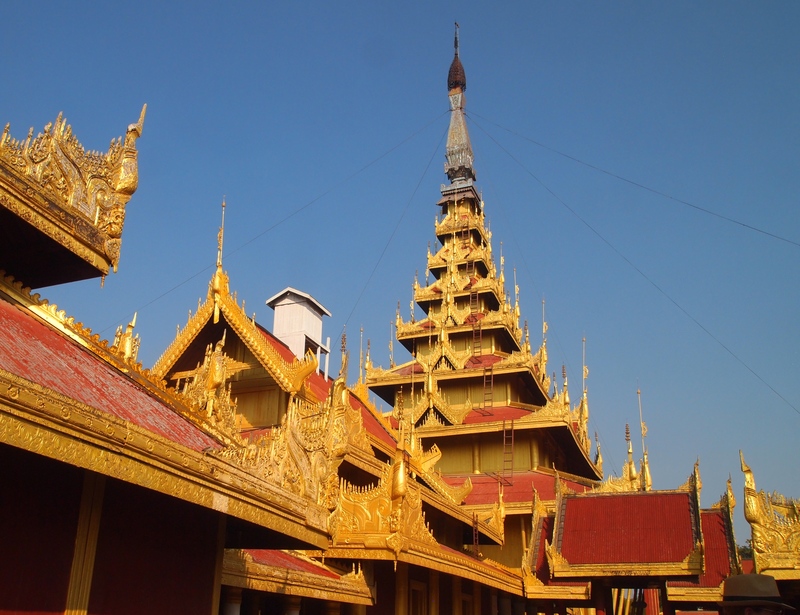 The building has a 78-meter-high towering spire which was gilded with gold. 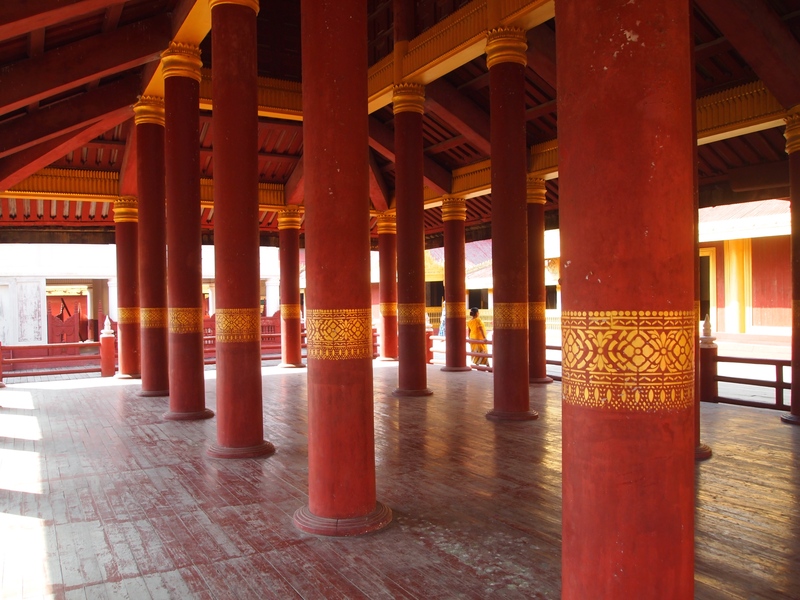 This is King Mindon’s version of the center of the world. 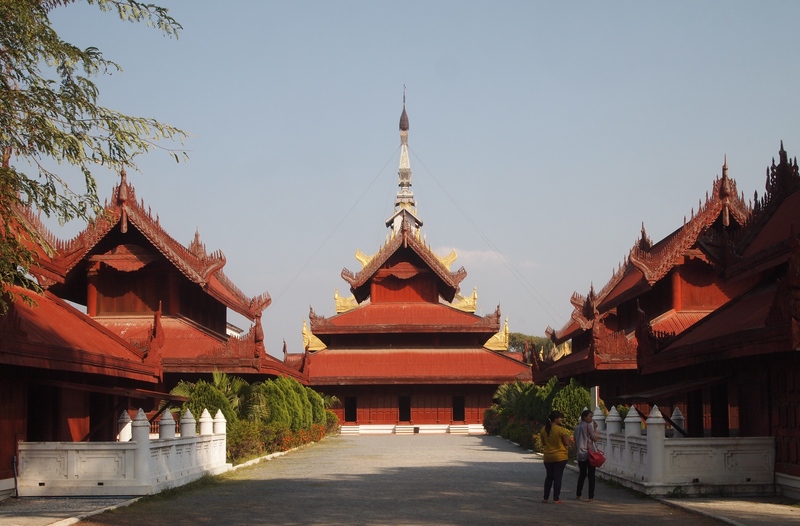 All I do here is stroll around the grounds, poking my head into the buildings from time to time to see what’s inside. There isn’t much. 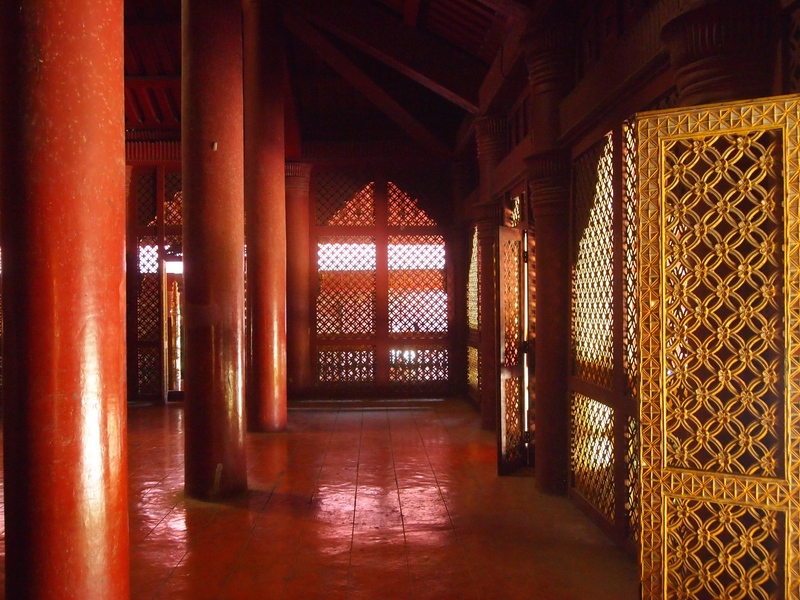 I’m reminded that I lose interest easily at sprawling abandoned palaces where kings once lived. 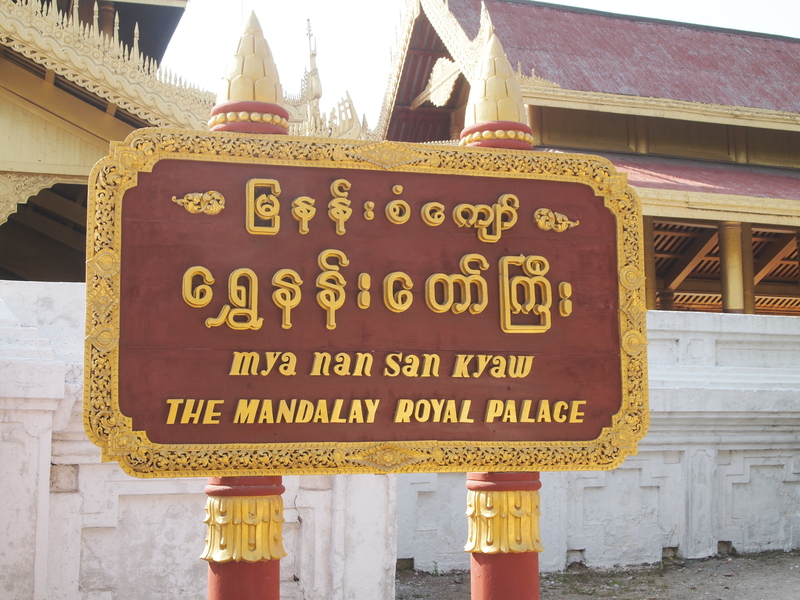 I’ve felt this way about nearly every royal palace I’ve ever visited. 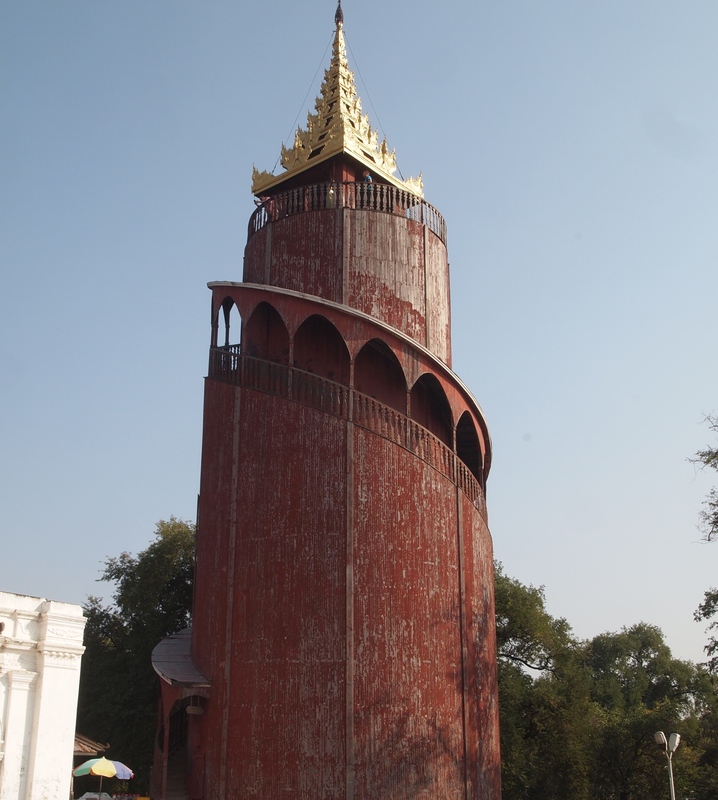 A watchtower on the grounds beckons. I feel the urge to climb to the highest vantage point at every place I visit, and this is no different. 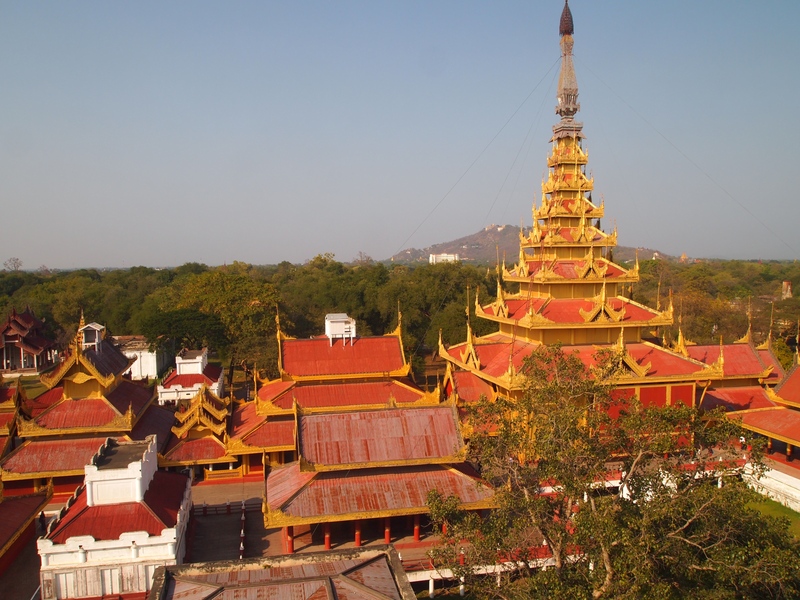 I climb the spiral staircase wrapped around the outside of the watchtower and admire the bird’s-eye views of the palace complex. 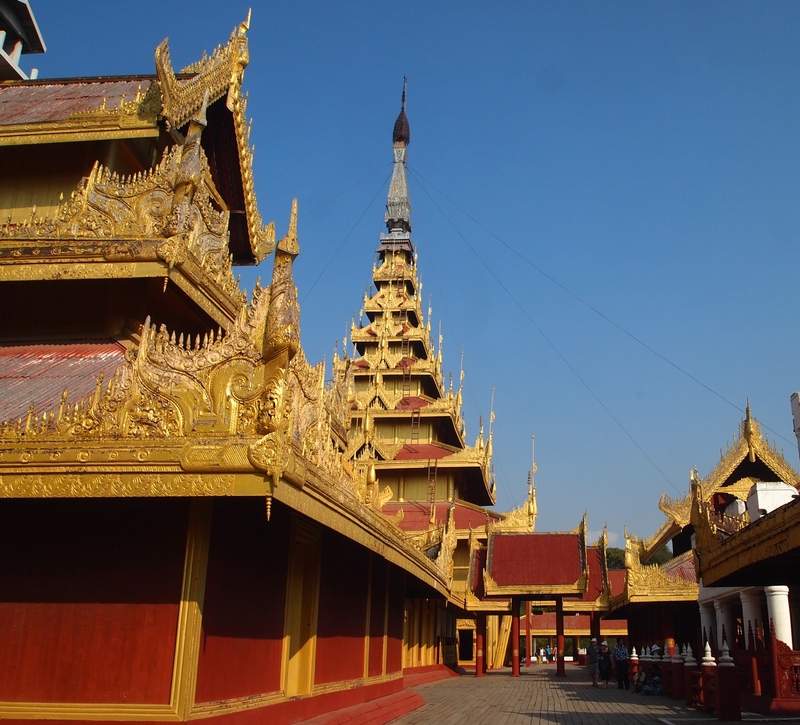 In November of 1885, during the Third Anglo-Burmese War, troops of the Burma Field Force entered the palace and captured the royal family. 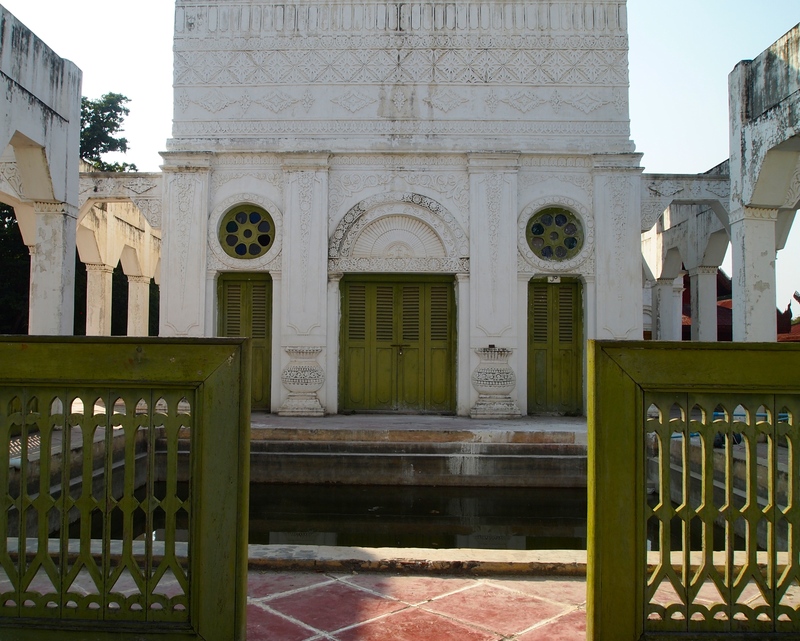 The British turned the palace compound into Fort Dufferin, named after the then viceroy of India. 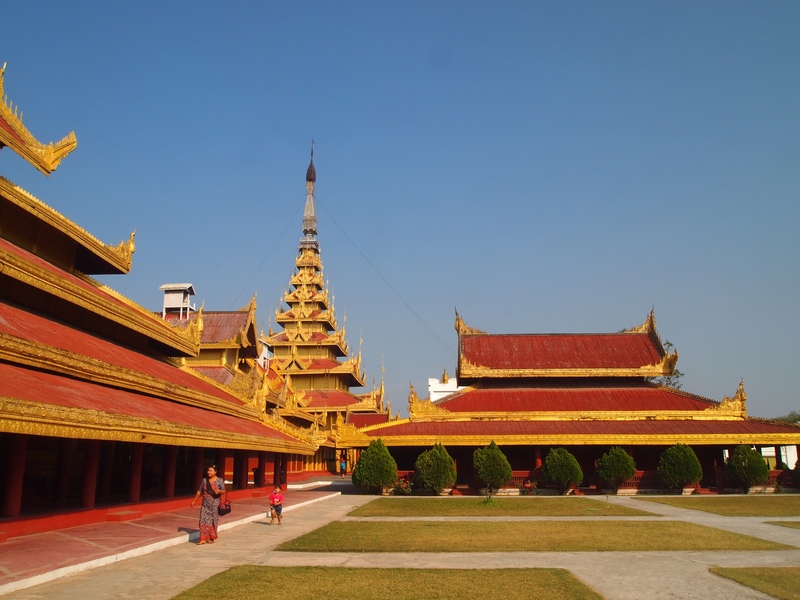 Much of the palace compound was destroyed during the second World War by allied bombing; only the royal mint and the watch tower survived. 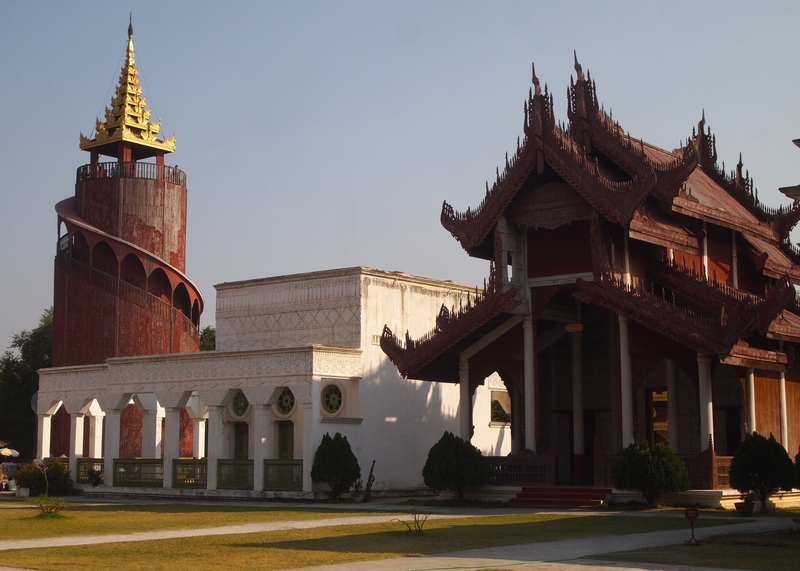 A replica of the palace was rebuilt in the 1990s with some modern materials (Wikipedia: Mandalay Palace). 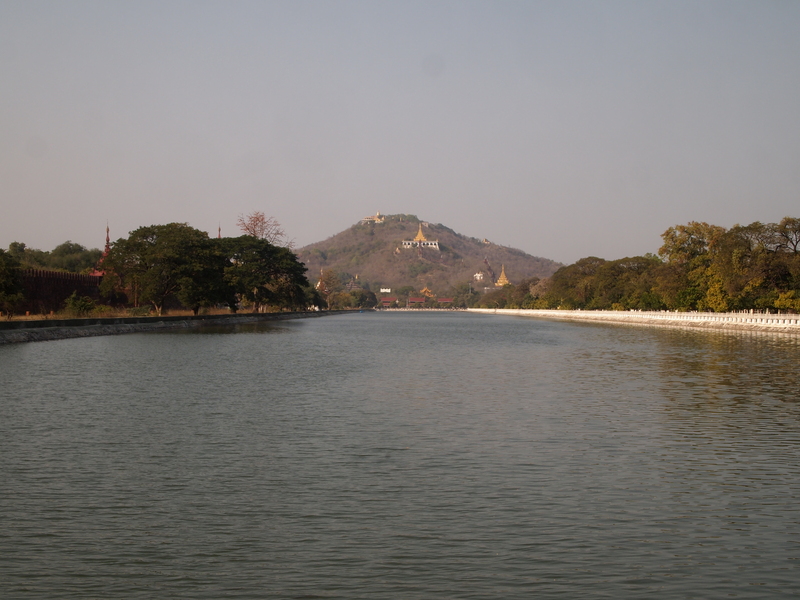 After exploring the Palace, I hop back in Mimo’s car, stopping for a quick photo of the 230-foot wide moat surrounding the 4-mile-long 26-foot-high palace walls. 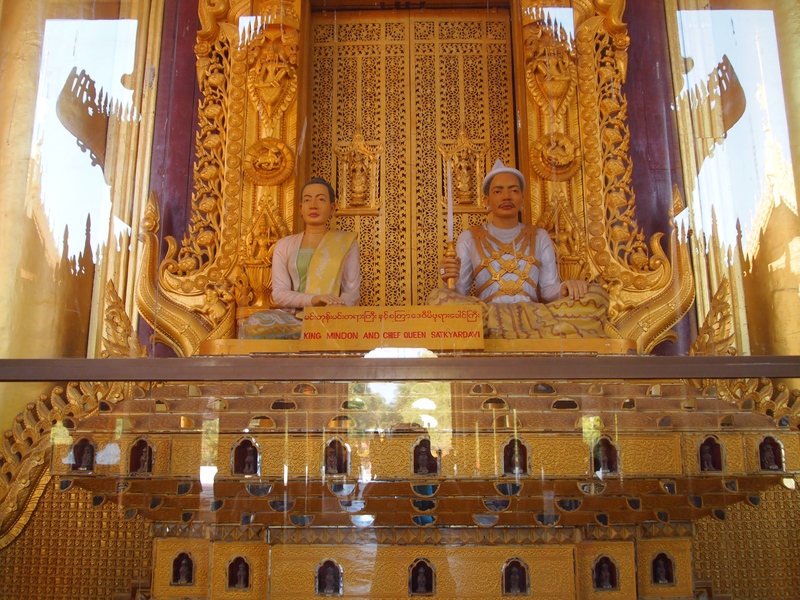 Then we head to a gold leaf workshop and the gold-leaf Buddha. The watchtower would be fab with a slide! I agree, Gilly! Perfect idea! We should let them know to convert it! Certainly fit for a King. but like you say a rather empty shell now. Looked like you had a beautiful day weatherwise for a change. So much gold! So ornate!